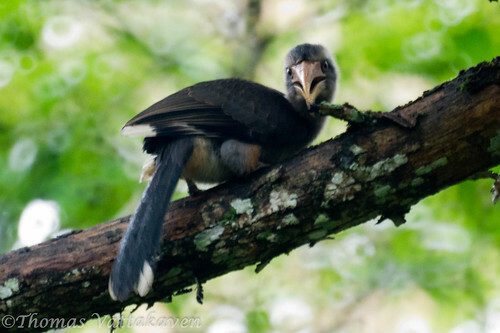 The Malabar Grey Hornbill (Ocyceros griseus) is a species of hornbill that is endemic to the Western Ghats of India. 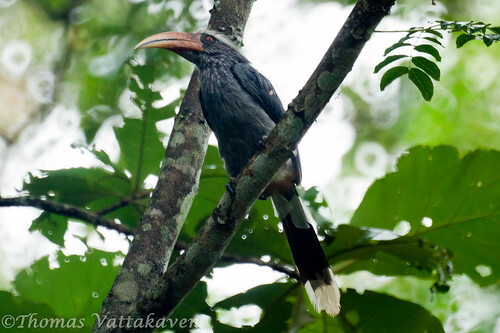 They are different from other species of Hornbills in that they lack the casque that is present above the beak that typifies the other members. 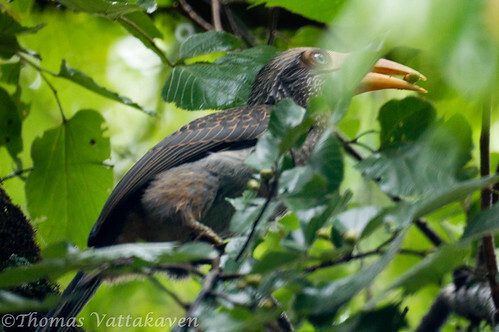 They are large birds and have a rather large beak that is reddish orange with a yellow tip for males and all yellow with a black base for the females. They move around in feeding groups and have a loud cackling call (listen here) and are thus more often heard before they are seen. Their flight is also loud and they move with flapping heavy beats followed by glides. 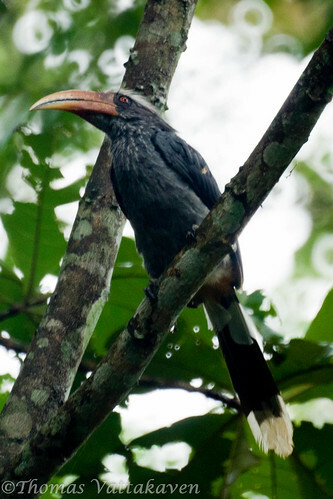 When on the trees, too, they jump from branches and trees as they feed mostly on fruits. However, they are known to feed on vertebrates and will accept meat in captivity! 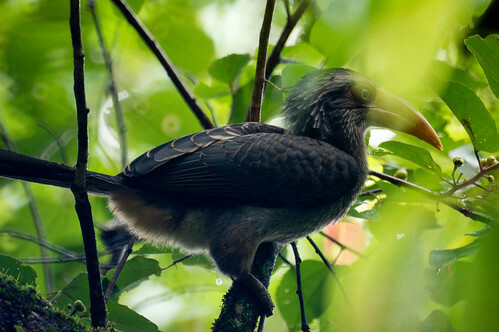 These birds occur mostly in the tropical rain-forests amongst dense tree cover. 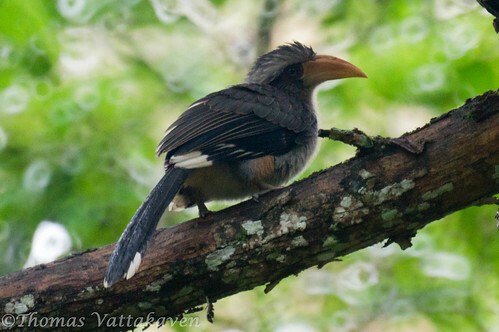 They are important seed-dispersal agents for many forest trees. The breeding season for these birds is from January to May. 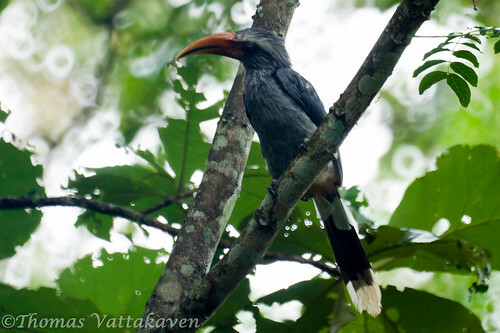 These Hornbills cannot excavate their own cavities for nesting, hence they occupy pre-existing cavities in trees. They are monogamous birds and mate for life. A pair will use the same cavity for nesting year after year. During nesting, the female seals herself inside the nest with a cement made from her droppings. Only a small hole remains, through which she removes her excreta and accepts food brought to her by the male. The male taps on the tree to call the female. Her is also responsible for finding and bringing food to feed the chicks once they are hatched. 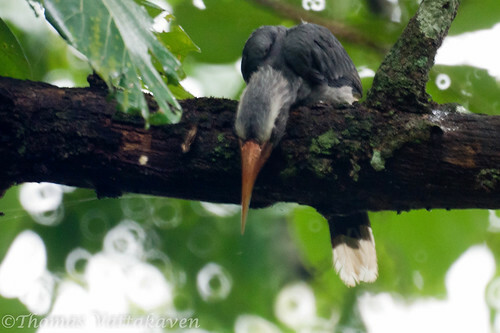 These images were taken on a rainy monsoon day in Periyar National park, Thekkady, Kerala using a Sony A550 DSLR with a Minolta 500mm f8 lens.